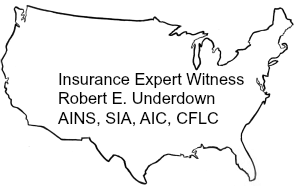 Mr. Underdown has testified in numerous cases involving bad faith involving insurance agents, brokers and insurance companies. The cases have varied from standards such as writing a policy to cover the interests of two separate insureds, to a broker charging fees and commissions. Mr. Underdown developed a systematic method for bidding insurance programs. The method involved selecting competing brokers for each line of coverage and allocating market to each broker to assure the best price. Mr. Underdown has purchased insurance for a variety of organizations and thus has experience in designing the specifications for and confirming the appropriateness of the policies provided by the selected brokers. He subscribes to the theory that the design of an insurance program begins with a survey of top corporate executives to determine the corporate appetite for risk. As a result of his background as a Claims Manager and Risk Manager, Mr. Underdown is in a position to provide coverage opinions based on real-world examples and on-the-job experience. He has dealt with a wide variety of coverages, including: property and casualty, vehicle fleet, property, directors & officers and workers’ compensation, to name a few. Excess coverage refers to the layers of insurance coverage or insurance policies over what is termed the “underlying” coverage or primary policy. As a Risk Manager, Mr. Underdown has experience in the selection and placement of umbrella insurance policies with up to $100 million in limits. Based on his experience, it is his opinion that one of the most important parts of a well designed insurance plan is the foundational or primary limits over which the umbrella policies are placed. Based on Mr. Underdown’s education, experience and training in the insurance industry, both as a Claims Manager and a Risk Manager, he is qualified as an insurance Expert Witness in jurisdictions across the United States. As a result of his insurance industry experience as a Third Party Administrator, Insurance Company Claims Professional, Risk Manager and licensed producer, Mr. Underdown is well qualified to render opinions on insurance industry standards. As a Risk Manager, Mr. Underdown developed a system for insurance placement that won critical acclaim from insurance brokers and insurance companies alike. The heart of Mr. Underdown’s system is the detailed review of specifications and then the assignment of specific insurance company markets to one of two participating brokers. The first step to any insurance program is to design the program to provide an adequate level of protection relative to the risk tolerance of the insured corporation. Another step is to choose the appropriate brokers to compete for each line of coverage. The funding of an insurance program must necessarily come from internal; however, premium finance arrangements can be made. Also, there are a number of alternative funding arrangements, such as minimum premium plans for group health insurance and retrospectively rated plans for casualty coverage. No matter what funding arrangement is utilized, it is important for the Risk Manager to maintain a proper reserve for the ultimate payouts for policies, claims, and expenses. The purchase of insurance can be fairly straightforward, such as purchasing a fire policy to protect the value of a building. On the other hand, purchasing policies such as Directors & Officers, Professional Liability and Surety policies is more complex because of the necessary disclosure of sensitive financial information. In addition, there are also certain representations and warranties that are required under some of these policies. Mr. Underdown has developed a system for insurance placement that won critical acclaim from insurance brokers and insurance companies alike. The heart of Mr. Underdown’s system is the detailed review of specifications and then the assignment of specific insurance company markets to one of two participating brokers. The assignment of markets is an inherently subjective process wherein a determination of the probability of success is factored into each assignment. The entire process is very closely monitored by the Risk Manager. As a Risk Manager, Mr. Underdown had a role as a counterparty to the underwriter. In the purchasing process, the Client/Risk Manager has to work closely with the underwriter to develop adequate detail about the risk to be assumed by the underwriter. Without adequate information it is difficult for the underwriter to rate the risk and develop a proper premium. Therefore, Mr. Underdown has a great deal of experience in the underwriting process. However, if your case requires an expert with actual underwriting and rate making experience I would refer you to another expert in that area. Please feel free to call (480-216-1364) or email me (bob@bobu.net) for further information. Please email or call me with whatever specialty you are looking for and I will find you an expert, whether it be in the insurance field or any other field in which a forensic expert is needed.